Raúl Barón Biza (1899-1964) was many things: writer, cynic, millionaire, politician, lover, pornographer & a victim of suicide. Many online sources dig into his fascinating life, but for this post we’ll limit ourselves to his first love, her tragedy & her burial. — You’re thinking of using an airplane as your method of transportation? — Of course! I’m training now to begin a quick trip around this country that I love so much. — Will this be a groundbreaking trip? — I don’t know –she says smiling– that will be for you to decide. I’m thinking about flying over all 14 provinces. And I’ll do it in my small B.F.W. airplane, with an 80 horsepower Siemens engine. — You realize that someone else has already flown over all 14 provinces? — I do. And with time on my side, I’ll do it as well. — In how many days? — Does your airplane have a unique name? — Once finished, are you considering another big trip? — Yes. I will try to show that a small plane, made for tourism, can do some interesting things. — That’s a risky undertaking. — It will be. But I’ve got enough enthusiasm to give it a go. And after this last sentence, the charming movie star who has mastered all types of sport bids us goodbye to resume her training. 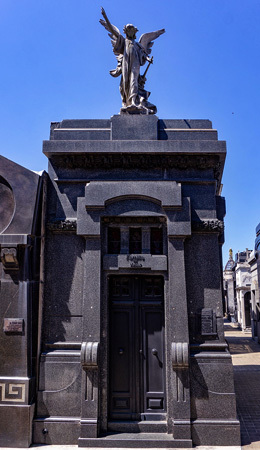 Three days after the accident, Stefford (who was never mentioned as “the wife of Barón Biza”, something rare for the time) & her instructor Luis Fuchs were buried in Recoleta Cemetery. 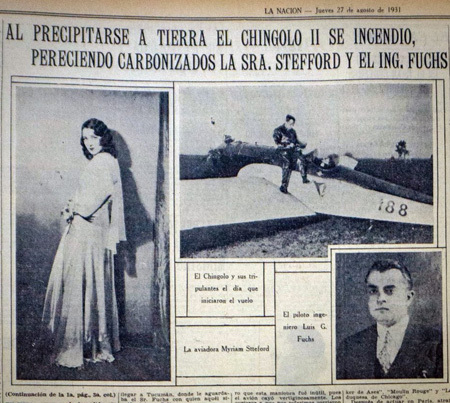 The actress/aviatrix was laid to rest in a mausoleum which then belonged to Wilfrid Barón, the father of Barón Biza. The structure was later sold to the Fabre family, & next to its current owner, the De Viñas family. 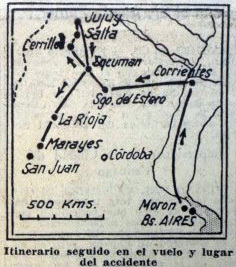 Myriam didn’t stay in Recoleta long, since Raúl Barón Biza immediately ordered the construction of the largest sepulchre in the country: a monstrous vault 82 m tall placed in the countryside of Los Cerrillos, near Alta Gracia in Córdoba province. 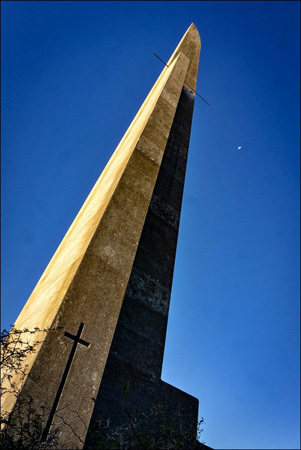 His friend, the engineer Fausto Regino Newton, designed the concrete monument whose meaning remains unclear to many: Is it the profile of a plane’s wing, as is often said? 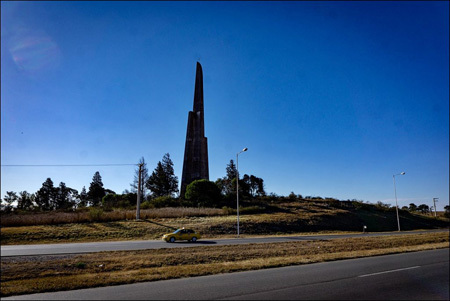 Is it an obelisk, taller than the one in Buenos Aires as many people from Córdoba proudly claim? Or is it an Egyptian symbol of resurrection? 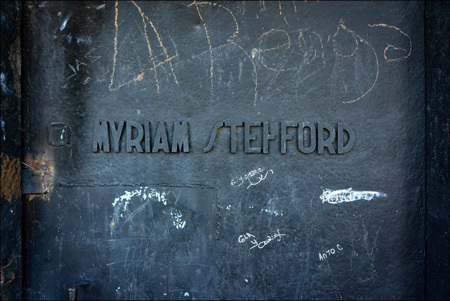 Whatever its significance, Myriam Stefford moved there on 22 Nov 1935 & was placed under several meters of cement… that’s when legends began to circulate. It’s said that she was buried with her jewels, among them a 45-carat diamond named the “Cruz del Sur”, with Barón Biza laying traps to prevent anyone from profaning the tomb—including placing explosives—& on the very top a beacon whose light could be seen for several kilometers. 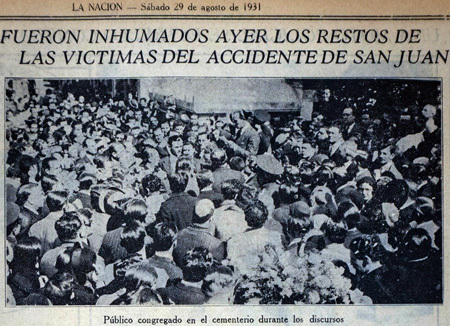 The truth is that the monument remains in place after all these years, after a second great tragedy in the life of Barón Biza: one afternoon in August 1964 in an act of rage, he threw acid on the face of his second wife, Clotilde Sabatini, & immediately afterwards shot himself in the head. 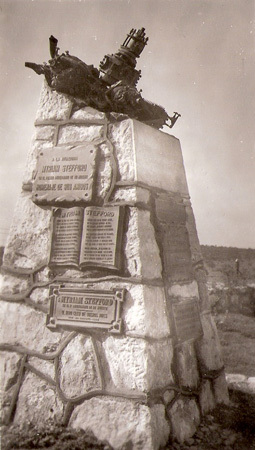 He had sold the land where Stefford’s mausoleum sits in Alta Gracia many years earlier. This is how it looks now, abandoned & alone. A project has been proposed to convert the area into a theme park about the enigmatic writer & his young wife who passed away prematurely. In the meantime, the “wing” attracts the curious, as well as architecture fans & film students… also a number of distraught people who have unfortunately committed suicide by jumping from the tallest window. 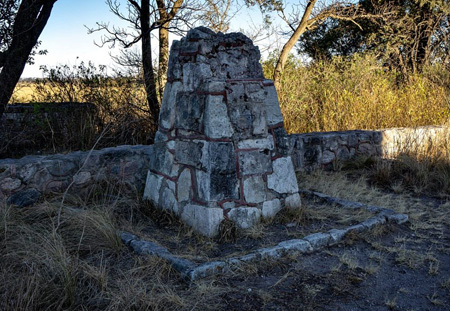 Originally, the monolith displayed the motor of Chingolo II along with many plaques but all have since been removed or stolen. 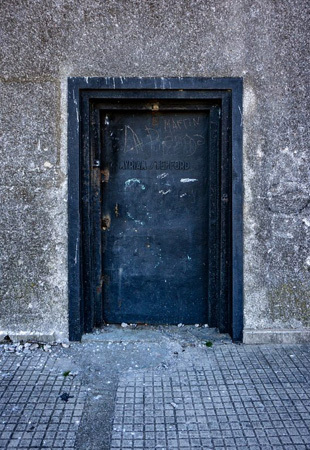 The entrance to the monolith remained opened for many years, but vandalism & attempted profanation prompted officials to solder the door shut permanently. No one now climbs the hundreds of steps to reach the top; supposedly the last time was in 2008. 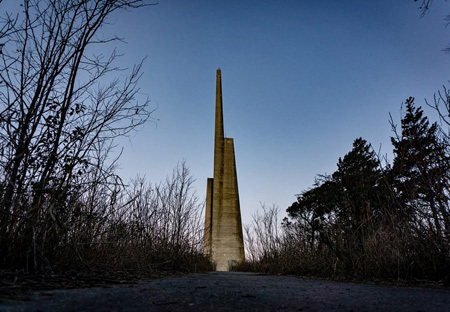 The future of this forgotten monument remains uncertain. Thanks to co-author Marcelo Metayer for contributing this post. The original version in Spanish (with additional text & photos) can be found on his blog: El Navegante Solitario.